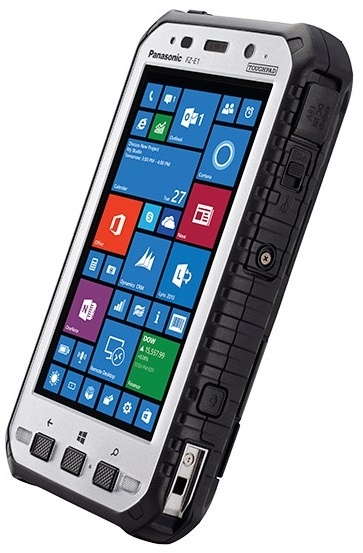 ATEX ZONE 2 CERTIFIED 5" HANDHELD TABLET WITH WINDOWS EMBEDDED 8.1 HANDHELD - Panasonic Toughpad FZ-E1 ATEX brings together the best of handheld, smartphone and barcode reader functionality into a single rugged 5" tablet. It is an ideal tool for ATEX zone 2 workers in the mining, oil & gas, large plants, chemical and pharmaceutical sectors. Thanks to its fully-rugged design with MIL-STD-810G certification, IP54 ratings and 1 meter drop resistance, the FZ-E1 ATEX promises a long life span and very low TCO. With operating temperatures of -20°C to +40°C, glove & rain-enabled daylight-readable display and a high capacity 6200mAh battery, ATEX zone 2 workers can operate anytime and for as long as they need. Despite its small 5" display form factor, the FZ-E1 ATEX comes packed with the ability of a smartphone, handheld and barcode reader in a fully rugged IP54 design. Its state of the art Qualcomm® quadcore processor together with 2GB RAM guarantees high performance. The high capacity 6200 mAh battery comes as standard and offers an amazing 14 hours of continuous data access; 23 hours talk time or 1000 hours in standby.